I am in the middle of reading a commentary on the Apocalypse published in 1955 by Fr Hermann Kramer and called The Book of Destiny. It is better and more erudite than you might suppose from its title. I learned about it when listening to a talk by Hamish Fraser, who refers to it as the most interesting book that he has ever read. Fr Kramer takes the Apocalypse to be principally a chronological prophecy of the Church’s future from the apostolic age to the Parousia, though with some reprises, rather than, say, a depiction of permanent features of the Church’s situation in this world. He offers some interesting interpretations of the 7 trumpets of Apoc. 8 and 9. On the assumption, reasonable given his general approach, that the description in 7:13-14 of those who have come through the great tribulation represents the Church as she emerged from the Diocletian persecution, he argues that the seven trumpets announce events that follow this period of freedom. The first trumpet he takes to mark the barbarian invasions. His interpretation here is perhaps too literal: he suggests that the burning up of a third part of the trees might refer to a serious disruption of agriculture, at that time. Earlier, by contrast, he suggested that ‘tree’ might be taken to refer to the leading men of the time, and this might apply better here also. Although he doesn’t mention it, the burning up of all the green grass would fit well with his view of the barbarian invasions as a punishment for excessive luxury. The Fathers interpret ‘green grass’ as a symbol of concupiscence, in the Feeding of the Five Thousand. And the second angel blew sounded the trumpet: and as it were a great mountain, burning with fire, was cast into the sea, and the third part of the sea became blood. And the third part of those creatures died, which had life in the sea, and the third part of the ships was destroyed. Fr Kramer thinks this is a reference to Islam; and it does seem antecedently plausible that so terrible and permanent an enemy of the Church would be mentioned in the only canonical prophecy of the Church’s life (if that is indeed what we should understand the Apocalypse to be). ‘Fire’ suggests, among other things, the passionate fanaticism of militant Islam, while ‘mountain’ is a good symbol of its bulk, impermeability and deadness. ‘The creatures which had life’ is literally ‘the creatures which had souls’, suggesting the death of the soul caused by the prolonged Mohammedan usurpation. He also suggests that ‘ships’ here might be a symbol for ‘churches’. Might one-third, approximately, of the churches then existing have been desecrated by Islam? And the third angel sounded the trumpet, and a great star fell from heaven, burning as it were a torch, and it fell on the third part of the rivers, and upon the fountain of waters. And the name of the star is called Wormwood. And the third part of the waters became wormwood; and many men died of the waters, because they were made better. This disaster differs from the previous two, since it is said to proceed from ‘heaven’. The author interprets heaven throughout the book to refer to the Church, considered as endowed with heavenly gifts. Apoc. 1:20 itself strongly suggests that ‘stars’ in the Apocalypse will refer to bishops or priests. 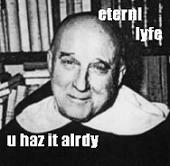 A ‘great’ star, therefore, says Fr Kramer, will be an eminent bishop or metropolitan. It is said to be burning even after as it descends (unlike the stars that fall in 6:13, 9:1 and 12:9), suggesting that it still gives some light to the faithful after leaving the Church, indicating rather schism than heresy, and the continued presence of erudition. The star is called ‘Wormwood’. In Jeremiah and Amos, wormwood is mentioned in connection with priests who are disobedient (Jer. 9:13-15), and who teach falsely (Jer. 23:11-40), and with those who pervert the sources of justice (Amos 5:7). 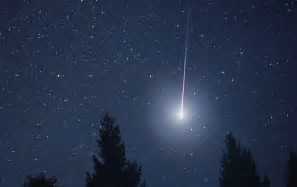 These last people are told, instead, to ‘seek him that maketh Arcturus and Orion’ (Amos 5:8), which, if we accept the symbolism of a star as a bishop, implies a command to recognise the diving origin of the hierarchy of the Church: again, a warning against schism. Wormwood is to be given those people, priests, and bishops who refuse to obey the authority of the Church which possesses this authority by divine commission from Christ. This is schism, ad formal schism is grievous sin. And many shall die from participation of the fountains, the sacraments, polluted by the star fallen into schism. […] The fallen star is guilty of pride, hypocrisy, and rebellion, when he assumes unlawful authority over others and perverts and refuses submission to the true order established by Christ. It begets pride and rebellion in his followers. They follow a slippery path and must stumble and fall after they have partaken of this poisonous potion. Sharing in the hypocrisy and rebellion of their schismatic superior, they knowingly partake of his wormwood and become wormwood themselves. Surely, as the author implies, this describes no one so well as Photios the Great? His very name suggests a shining light, and he was famed for his learning. 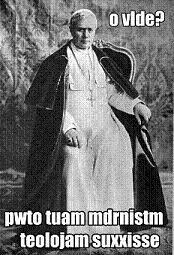 He was a great star, too, metropolitan of a see that claimed second rank in the Church, but he broke away from the constellation appointed for him. A great number of dioceses, though still a minority, were struck by his calamitous fall and the sources of grace to this very day have been made bitter for all those who knowingly partake of his schism. What, in fact, is more bitter than schism, directly opposed as it is not to the faith, but to charity and joy and peace? Islam is not simply a revolution brought about by Arabs who, bored of living under their tents, were stirred up by a gifted leader to make a sudden conquest of the most opulent cities of the East. Rather, God allowed the ancient enemy of mankind to have a special opportunity, and to choose an instrument by which he might lead nations astray, enslaving them by the sword. And so there arose Mahomet, the man of Satan, and the Koran, his gospel. But what was the crime which induced divine justice to go to such an extremity, abandoning nations to a slavery of which we can still see no end? Heresy: for heresy is a dreadful crime which makes the coming of the Son of God into this world to be of no avail. It refuses the word of God; it tramples upon the infallible teaching of the Church. Such a crime must be punished, in order that Christian peoples may learn that no nation resists the revealed words without the danger of suffering, even in this world, the penalty of its rash ingratitude. And so Alexandria fell, though it was Peter’s second see, and Antioch, where he had first been bishop, and Jerusalem, keeper of the glorious Tomb. We shall stop here, having acknowledged the justice of God in regard to heresy, and the true reason of the victories of Islam. We have seen the only reason why God permitted Islam to arise, and why it did not remain an obscure and ephemeral sect in the deserts of Arabia. The impartial and unchangeable justice of God metes out reward for good deeds and punishment for sin. But since the life of peoples and nations, as such, does not outlast their world, they necessarily receive the rewards due to their deeds on this earth. I’ve been looking at The Church in Council by Norman Tanner SJ. Fr Tanner is perhaps the leading authority on ecumenical councils in the English-speaking world. It’s curious, therefore, that he seems keen to get rid of as many as he can. Vatican II, he says, extended the meaning of Church beyond ‘the Roman Catholic community’, and therefore made it a moot point whether any council could be called ecumenical without the participation of ‘other Christian churches and communities’. The Eastern Church, we learn, was not represented ‘in any proper sense’ at any post-1054 council – a fact which would no doubt have surprised the Byzantine Emperor and the Patriarch of Constantinople in 1439, not to mention the other bishops and patriarchal delegates who had gathered at Florence. Trent, Vatican I and Vatican II don’t even reach the dignity of general councils of the Western Church; since the ‘churches of the Reformation’ were absent, they are better seen as ‘general councils of the Roman Catholic church, rather than of the Western Church’. This ‘removes the necessity of Trent and Vatican I being given an absolute status’ (but apparently not of Vatican II being given it!) So much for the holy Sacrifice and for papal infallibility; they will apparently have to enjoy only a ‘relative status’, whatever that might be. He is quite keen on the role of the emperor in the early councils, as it provides a precedent for lay involvement. Likewise, in the Empress Irene at Nicaea II, as a precedent for female involvement. Likewise in the fact that the early councils were held in ‘Asia’. And he also likes the fact that Constantine wasn’t baptised at the time of Nicaea I, as this provides a precedent for influences on ecumenical councils from outside the visible church. I can’t help wondering if his ideal council would be one held in Mumbai under the presidency of a Muslim woman, and which would solemnly condemn Humanae Vitae. But I may be wronging him. 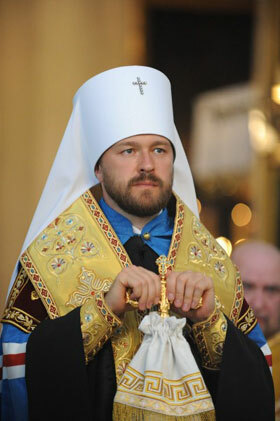 Metropolitan Hilarion (Alfeyev) of Volokolamsk of the Russian Orthodox Church expressed the hope that Pope Francis will continue the policy of rapprochement with the Orthodox Church and will not support, as he calls it, the expansion of the Ukrainian Greek Catholics, the site of Pravoslavie i Mir reports. “The union is the most painful topic in the Orthodox-Catholic dialogue, in relations between the Orthodox and the Catholics. If the pope will support the union, then, of course, it will bring no good,” he said in a program on the channel Rosiya-1. One of Pope Francis’s teachers was a Ukrainian Greek Catholic priest, and the pope belongs to the Jesuit Order.